After he left school my late father Bill Higgs (5 back 28 New Spring Street) played for local football team Bromsgrove Brookfield, (usually shown as ‘Brookfield’ rather than ‘Brookfields’) both before and after the war. In researching his life I have explored the exploits of the team over a 20 year period from the early 1930s. 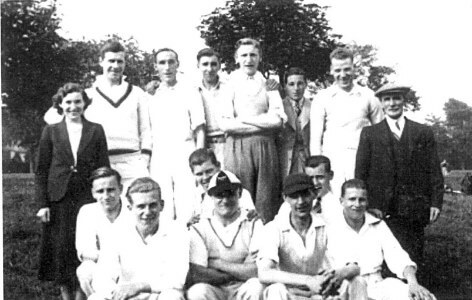 In the 1930s Bromsgrove Brookfield competed in the Birmingham Youths’ and Old Boys’ League. Where the Bromsgrove part of the name came from is not clear at present, but the Brookfield element was undoubtedly linked to the Hockley area. To emphasise that point, the Club Secretary in the 1930s was Robert Houston, who lived in Ellen Street. The team joined the Youths’ and Old Boys’ League at the beginning of the 1932/33 football season, participating initially in Division 2 of the Junior Division of the BYOB Suburban League. The team had formerly played within the Birmingham Juvenile organisation and the players were usually in their mid to late teens. The first couple of seasons resulted in no more than mid table positions. However, in the 1934-35 season the team was narrowly pipped to the title by Birmingham Settlement, whose victory in the last match of the season secured top spot. The following season the team dropped to third position in the league but Bromsgrove Brookfield won the League’s Junior Cup for the first time, beating Turk Victoria in the final, played at the Mitchells and Butler ground, by two goals to nil. Then came a change of name in time for the 1936-37 season, with the team emerging as Brookfields Athletic (now with an ‘s’ at the end of Brookfield). Once again success in the league proved elusive but there was some consolation in the form of victory in the final of the Queens Hospital Medal Competition. The Birmingham Youths’ and Old Boys’ League was reorganised during the 1937-38 season with the formation of a Senior Division 2, with Brookfields Athletic participating at that level. Not surprisingly, when competing at a higher level the team failed to win any silverware, having to be satisfied with a mid table league position. The following campaign provided many challenges, with Brookfields slipping down the table. Cup competitions also failed to offer any compensation, with only a semi final place in the McGregor Cup of any note. With the onset of World War 2 serious competition ended until 1945. With World War 2 over, the league re-commenced with many players returning from the forces to re-join their teams. At this point the team assumed its old identity of Bromsgrove Brookfield, joining the Second Division of the Suburban League. The early post war years brought little success and the players had lengthy journeys to undertake for home matches, which were played at Knowle FC’s ground near to Solihull. One of Bromsgrove Brookfield’s most successful periods began in the 1947/48 season. From the very start they looked an impressive outfit and they were unbeaten up to the new year, by which time one of the players, Frank Wilson, had scored in every match in which he played. Moreover, Frank was no outsider drafted in to strengthen the team, as he made his way to matches from his home in Rosalie Street. Not surprisingly the team swept to the Division 2 title, ultimately winning all but one of their matches. The only defeat was to the eventual runners up Paget Old Boys, but they gained revenge for that setback by beating Paget by five goals to one to seal the title. The club also reached two cup finals during the season. The first was the final of the West Bromwich Albion Shield. That match was played at St Andrews on 19 April 1948, when Bromsgrove Brookfield defeated the coincidentally named St Andrews Athletic by two goals to one. One week later they contested the final of the Queens Hospital Cup against City Transport at the Bournville ground. That resulted in yet another victory, the first occasion on which a club from the Second Division of the league had lifted the trophy. Now promoted to the First Division, the 1948/49 season was one of consolidation, although the team did reach the semi final of the League’s Senior Cup, losing to Knowle in a replay. However, the 1949/50 season was to be the one in which the team firmly established itself as the strongest outfit in the league. Bromsgrove Brookfield swept to the league title and also competed in two cup finals, winning both of them. They were again victorious in the Queen’s Hospital Cup, and in a spectacular end to the season the team won the Senior Cup at no less a venue than Villa Park, when they defeated Catherine de Barnes. The players during the season included H Cook, R Baxter, D Mayers, Reg Williams, R Bates, J Brown, S Summerfield, R Stevenson, Horace Welham, C Headley and Frank Wilson. Repeating those achievements the following season proved to be beyond the team, and after a hard fought campaign they had to be satisfied with third place in the league. However, there was some silverware in the form of the Evelyn Cecil Shield when two goals from Reg Williams in the final helped to defeat Billesley Carnegie by two goals to one. Successes followed in the early 1950s and the 1951-52 season saw the team once again claim the league title, scoring over one hundred goals in their 26 matches. They almost claimed a double, appearing in the Aston Villa Shield Final, played at Villa Park. However, Catherine- de- Barnes gained revenge for their defeat in the Senior Cup Final at the same venue two years earlier. The players during that season included N Hodson, J Brown, G Gamble, H Cook, D Mitchell, D Meyer, S Summerfield, Horace Welham, F Stevenson, Reg Williams and S Essex. There does not appear to have been any silverware over the following two seasons and that is the point at which my researches have ended. If anyone has any memories of the team, between the 1930s and the 1950s, whether through their own involvement or that of a relative or friend, I would be very pleased to hear from them. I can remember them being sewn onto the white cricket caps, notice the Brook and Fields depicted on the Badge. I remember the B.C.C home ground used to be Somerfield Park (up the back by City road entrance ), I also remember them playing at Lightwoods park and Handsworth park. (Old Joe Grinnell 3/111 Hingeston street ) also at another one of the members houses Len Weston was his name, the picture of the team I sent you shows all these as well as some others. are still going (I doubt it), I will let you know if I find or remember anything else. 253rd B,ham 1st Brookfields scout group band county champions 6 years running 1960's this was taken about 1967 in the playground of Camden street school.